Armagnac is one of those rich yet light brandies, it’s French, made from white wine grapes. Being made from grapes doesn’t mean it’s a low ABV drink. The alcohol levels can be between 50% and 58%. Many producers prefer the extra few percentages although some producers will continue and age their Armagnac, and dilute to the minimum 40% at the boiling stage of production, which we will get into later! In the region of France known as the Landes, they produced what they called, fire water, which was initially used for therapeutic cures. Sipping Armagnac for pleasure only started once they found out that storing the spirit in barrels developed delectable, non-medicinal, flavors. When tasting Armagnac, a trick is to dab your finger in the glass and then dab it onto the back of your hand. Wait for the liquid to evaporate. Bring your hand to your nose and smell it up close. Here you should be picking up dried fruits, such as apricots and figs, or maybe even a bit of sweeter notes like butterscotch or licorice. We recommend a glass of brandy at the end of a meal, perhaps in a warmed glass, served neat in a snifter, inside a fruit-forward cocktail for a stronger backbone. A classic to get into is a flip cocktail which is kind of like a brandy sour, minus the sour made with cream and egg. 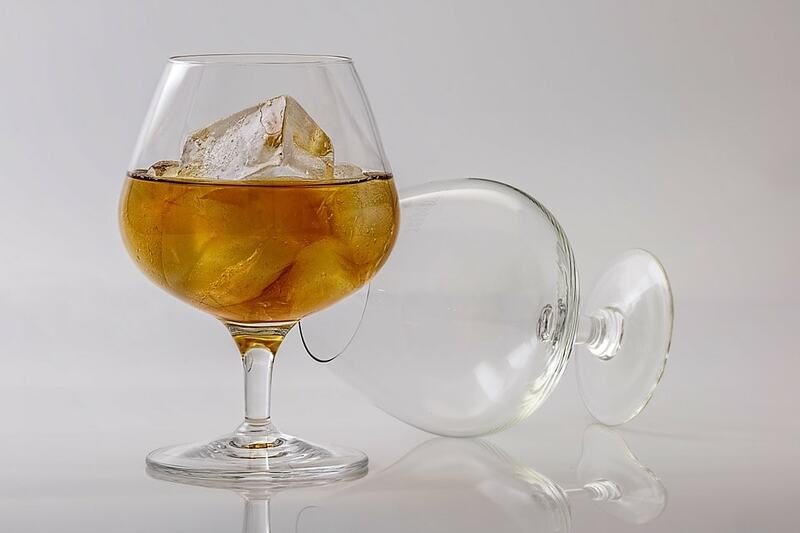 White wine tends to be thin in comparison to red wine, that’s why it is distilled for not just Armagnac but also for Cognac, the more popular of the two brandies. Armagnac uses four different white grape varietals: Folle Blanche which tends to be the main grape in Armagnac, Colombard, which tends to be widely used to provide fresh, young aromas to the spirit, Ugni Blanc grape, and Bacco Blanc. Bacco Blanc is a blend between Folle Blanche and American Noah which is not in Cognac! In fact, in 2010, the AOC determined hybrid grapes cannot be used in the production of Armagnac within AOC regions! Ugni Blanc is the most grown grape between Cognac and Armagnac because Ugni Blanc is a very resistant variety that happens to be easier to grow and more consistent of a product as it is not as affected by weather or other surrounding conditions. Speaking of surrounding conditions, climates of Armagnac has a range to which it can grow. It’s best with grapes grown between the mild and humid climates of the Landes and the drier climates with higher temperatures from Toulouse. In short, Armagnac grows in climates that are drier with sunny summers, but they have harsher winters than in Cognac. It goes to say that sometimes climates are out of the grapes control. There are strict appellation regulations that are governed for the Armagnac region. Below the Armagnac region, there are fine quartz sands, continental, and river sediments and siliceous clay because 300 million years ago, there was a sea that linked the Atlantic to the Mediterranean! To get very technical, this region covers Bas-Armagnac, Armagnac-Ténarèze, and Haut-Armagnac which was defined in 1909. Recently, they added Blanche d’Armagnac which was introduced to allow the production and export of the unaged spirit. The harvest of grapes typically happens at the end of October through mid-November. This, however, can vary depending on the weather and availability of the local, mobile distilling machine called ‘alambic still’. The alembic still is made of copper and contains two chambers, One that has a serpent coil heats the wine gently by using wood fire or gas. This controls the temperature which in return controls the vapors. These vapors are then condensed with the use of a sequence of scoops within the second chamber and drip out and once the desired alcohol levels are met, this liquid is then placed into barrels. The barrels are plugged with a cloth around the cork to allow for oxidation! There is an atmospheric loss over the years, liquid seeps into the sides of the barrels, which is commonly known as the ‘devils cut’. Once the desired maturity is reached the Armagnac gets bottled in large glass containers or bottles. After the Armagnac is inside a glass bottle, it doesn’t age further. It is quite common that producers will only bottle their oldest stuff on request to allow to further maturity of their already aging Armagnacs and allows for blending opportunities! The distillation process is what gives us the biggest differences between the two French Brandies, Armagnac and Cognac! Armagnac can be distilled as cool as 52 degrees which would give them prune notes while the higher temperature of the distillation, you start tasting more of a crisp fruit forward spirit. Armagnac can be distilled all the way to as hot as 72.4 degrees alcohol! Cognac distillation range is quite small in comparison, simply 67 degrees. As said before, you can have unaged Armagnac. Armagnac can be also be aged in Gascony oak barrels. Both brandies are sold as either vintages and blends, although they’re often blended. There are classifications for how long Armagnac ages though because Armagnac can be aged for a minimum of one year to reach the VS (Very Special) 2-3 years aging in oak casks or what is considered standard because it is (the least stringent aging requirement. The next classification would be an aging form 4-5 years called VSOP. Then there is Napoléon, which is aged in oak from anywhere between 6-9 years. Producers can continue to age it for 11 years creating Hors d’âge, XO! If Armagnac is aged, it is traditionally aged in barrels often blended and sold as ‘vintages’. If a blend is used then the youngest of the blend will be the age describing it. The highest quality, most refined and complex Armagnacs come from the Bas cru where the spirit ages much better. However, most of the production occurs in the Tenarézè cru which is where a more perfumed style is made. Armagnac is one of the earliest, non-industrial examples of distilled wines known in France. Armagnac has been recorded as being produced as early as the 15th century but, according to some historians, it dates even further to the 13th century! Armagnac is probably the oldest known wine spirit in the world but the art of distillation was introduced by the Arabs between 1411 and 1441. Its long history is intertwined with that of D' Artagnan's Gascony and is intertwined in the French historical heritage and gastronomy. But Armagnac has almost no exportation because they have a consumption about 20 times lower than cognac. One of the reasons Armagnac is not nearly as largely known as Cognac is because in the early 19th century there was a Phylloxera outbreak that affected all of the vines reducing the production by the 1930s to 600,000 gallons. By the 1940s trade was so low and it was costing more to produce than they the producers were making, many producers simply gave up. Armagnac’s production didn’t increase until well after WWII, around the 1960s when people started realizing the benefits of Armagnac. Consumers wanted the young, cheap stuff which couldn’t be cognac as they have aging requirements. By the 1990’s production nearly tripled with close to 1.8 million gallons. There is no such thing as aged cognac. We don’t mean to hate on Cognac with this article. But Armagnac is much easier to produce and yet we don’t drink nearly as much of it as we do Cognac. When you’re thinking of grabbing a glass of Hennessey next time, think twice. You might find you enjoy this fruit forward brandy slightly more.